Yesterday I was shopping around at some of my favorite stores in Los Angeles for inspiration and stopped into Des Kohan and found myself wanting everything in the store! If you live in Los Angeles and you haven’t gone into this store before, it is a MUST! Des has an amazing eye for chic effortless design and her Spring collection is so refreshing and chic. Des is known for her exclusives, including Hussein Chalayan and Viktor & Rolf, and for Spring she has acquired the exclusive on one of The Sche Report’s “ONES TO WATCH”, Damir Doma. Back in 2010, I highlighted Damir’s designs as a serious up and comer in the Paris Fashion scene. I love his clean approach to design as well as his architectural influences. When I saw his collection in Des Kohan yesterday I really lost it. I wanted every piece that she bought and it was so hard to have restraint and walk away without buying something! From the mustard high-low tank dress to the lace walking shorts and gold plated jacket…all of it is soooo beautiful. And so wearable. Perfect garments to wear in Los Angeles during the day with sandals and at night with a chic blazer and heels. Really in love and will be plotting and planning until I can go in and buy some of it! 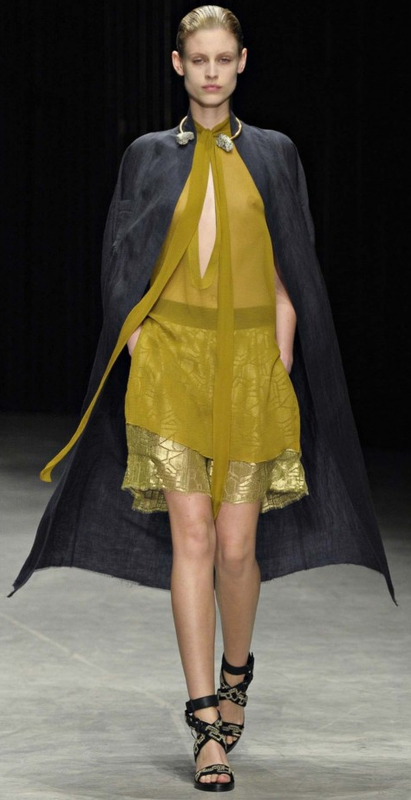 Take a look at the Damir Doma S/S 2012 collection below and go to Des Kohan’s new ecommerce website to purchase pieces from the collection. to be honest i don’t rellay understand where this originality issue comes from. it’s like claiming originality of fishnet stockings. who was the first to make them? who was the first to implement them into his collection? who was the first to wear them, thus, becoming a fetishist victim of that horror?ditto to sheer pants. it’s just a small part of the puzzle and hardly has any value itself, rather than supporting something bigger going on in any of these collections. isn’t it more of a stylistic gear than a wearable piece anyone believes to get to the selling floor? i doubt it would.